Attention, Peanuts fans! We have an announcement to make! Did you know that the Peanuts' history dates back as early as 1950, when cartoonist Charles Schulz's first comic strip was printed in seven different newspapers? Fifteen years later, good 'ol Charlie Brown, Snoopy, and the rest of the gang even made their way on to the cover of TIME in 1965…and on the screens of televisions! 1966 introduced Peppermint Patty, and shortly thereafter, in 1970, Snoopy found a little feathery friend named after the music festival "Woodstock." Now, 64 years later in 2014, we're pleased to announce that Charlie and the Peanuts characters will be joining the Put Me In The Story gang! For the first time ever, your child will be able to star alongside America's treasured Peanuts characters—becoming an honorary Peanut themselves—in original, personalized books created specifically for Put Me In The Story. We are incredibly excited to bring these classic comic strips to life with a fresh, new experience. 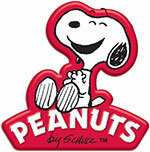 "We are thrilled to be partnering with Peanuts," says Dominique Raccah, CEO and founder of Put Me In The Story. "By adding these books to the Put Me In The Story personalized platform, we're giving fans young and old new ways to experience the beloved characters of Charlie Brown, Snoopy, and the rest of the gang—a Peanuts story starring YOU! Stay tuned for the release of the first books in the series collection—Good Grief, It's Your Birthday and Cheer Up, Charlie Brown—in September 2014. Make way for the Peanuts parade!